Pour several cups of chicken stock into a skillet, add 2 T of curry powder and sea salt. Place 2 organic chicken breasts in and let simmer slowly until breasts are tender and just poached throughout. Remove from heat and slice. Meanwhile cook down the curry and broth until there is a very small amount left in the pan. Add the chicken pieces back into the curry mixture and stir so they are thoroughly covered on all sides with curry. Remove and let come to room temperature. To make the curried mayonnaise dressing, add 1 egg and 1 egg yolk to your food processor. Add 1 t dijon mustard, a generous pinch of sea salt, a generous sprinkling of white pepper, and 1/8 cup of fresh squeezed lemon juice. Process for a minute or so and begin to very slowly drizzle in 2/3 cup of canola oil while processor continues to run until mayonnaise is thickened. Stop processing and add in 2 t curry powder. Process until blended. 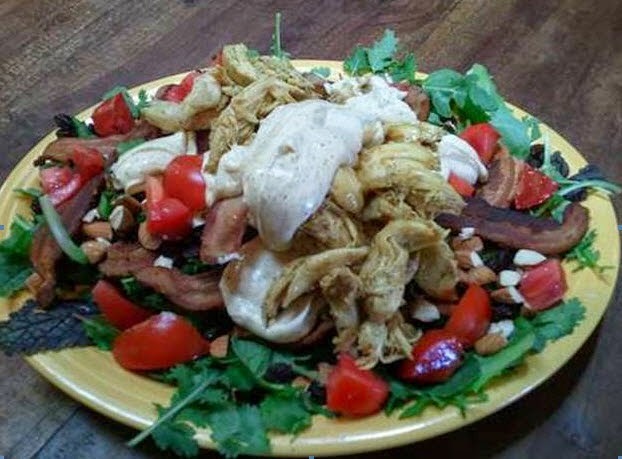 Put the lettuce into a large salad bowl and toss with the tomatoes, almonds and raisins. Scatter the bacon (whole slices) and chicken pieces on top and slather on a generous quantity of the yummy curry dressing.